Please note the information contained on this page is for general reference only. If you are considering crossing any national border by bicycle speak to a customs or immigration official prior to departure. Regulations will change so this is just a guideline. Canadian and US cyclists — a driver's license is no longer suffient for US or Canadian citizens travelling between the two countries. A valid passport is acceptable. There are other forms of suitable identification such as enhanced driver's licenses but please check with your local authorities before travelling to ensure you have proper documentation. Without this you may (assume you will) be turned away. And perhaps more importantly, you may have difficulty returning to your home country. Non Canadian and non US cyclists — check if you need a visa. If you think there is a possibility that you will cross the US/Canadian border the best solution is to arrange a visa before you leave home. Allow sufficient time to apply for the visa. If travelling from overseas and your flight stops in the US en route to Canada, you may clear customs and immigration at that transit point. You will be issued a visa of sorts, but it may only be a transit/one day visa and may not apply to re-entry into the US. If you do decide to enter the US from Canada and you haven't already organized a visa, it may be possible to obtain a short term visa at the border or at a local immigration office. There will be a fee. If it's a small border crossing you may need to have the correct change. Not all borders have full time immigration officers, so if you require a visa to enter and there is no officer on duty, you will be turned away. Landed immigrant, working visas – speak with Immigration of both countries before you travel. NOTE: Have an account of your travelling plans available to show the inspector. If you have route maps or other paperwork that's good and be prepared to provide estimates of how long your trip will take. Customs — Taking stuff across the border. For any expensive items (especially your bike, but also cameras, lap tops, etc. ), you may wish to complete an Identification of Articles For Temporary Exportation (for Canadians going into the US) or Certificate of Registration for Personal Effects Taken Abroad - Customs Form 4457 (Americans entering Canada). You can obtain these forms at the border or at your local customs office. Have the form(s) stamped at the border or prior to your trip. The serial number of the item is recorded on the form and proves the origin of the item. Otherwise the item could be dutiable (and in Canada, GST-able). Once completed and stamped, keep these forms, they'll be good for future trips. Non Canadian/US citizens should check with their own country officials for similar documentation. With bicycles, customs officials are looking to see if you purchased a new bike. In such cases the purchase may attract a duty and tax. The form(s) should travel with the item. If your camera is on your bike, keep the form with you. If your lap top is in a support vehicle, the form should be in the support vehicle. In cases where a motorized support vehicle will be carrying your personal effects you may want to write out a declaration for the driver. This should state which items are yours and that they are for your personal use only. A rendez-vous at the border with your support vehicle may be the best option. The person with the vehicle will be responsible for the contents. Know what you purchased in the country that you visited. When asked, itemize everything. There is no problem with purchases for your personal use, food, parts etc. Don't joke about what you might or might not have on your bike. The amount of stuff carried on a bike shouldn't raise any alarms but if the authorities sense a hesitation you may be pulled aside for a thorough search. If this happens, co-operate completely. If you aren't sure about your prescription medication, get a letter from your MD. On that note it can be difficult for U.S. citizens or residents to get perscriptions filled in Canada. You are best to bring sufficient quantities for your stay. Don't even think of carrying firearms or explosives across the borders. Some food items will not be permitted across the border. Be prepared to dispose of them if requested by customs official. Cycle Canada offers a range of cycling accessories through our online store. 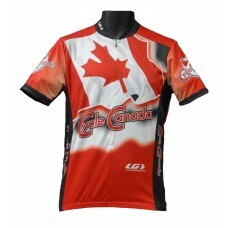 Our line of Canadian themed cycling jerseys are recognizable throughout Canada and around the world. Whether you are travelling overseas or across Canada » Wave the Flag in a Cycle Canada jersey. Please visit » The Cycle Canada Store for our sizing and selection. We offer supported tours from 2 days to 10 weeks throughout Canada. Here's a sample.